Educational Qualification : Graduation preferably in Mass Communication/Journalism area from a recognized University/ Institution. How to Apply Bank Of Baroda Vacancy : Interested Candidates may apply with bio-data with subject as PR Specialist Officer send by email to “recruitment@bankofbaroda.co.in” on or before 01.03.2018. High Court of Gujarat has liberated A latest job notification for High Court of Gujarat Recruitment. Organization invites online Applications from Dedicated and result oriented Job appliers to the engagement of 24 vacant positions of Driver in different departments. Aspirants must have 12th / Heavy Motor vehicle driving licence from well recognised Board according to post. 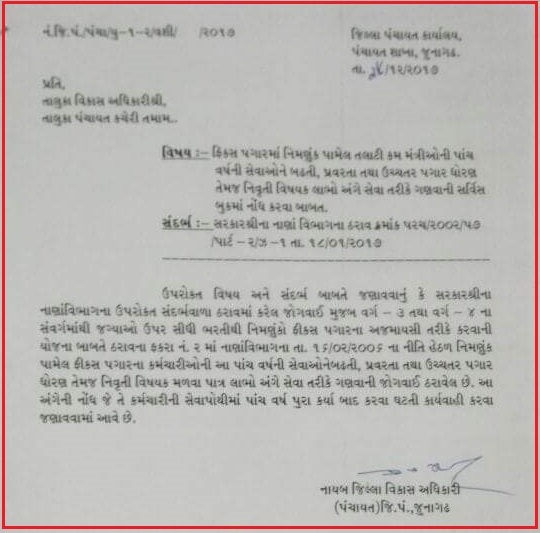 Candidates belonging General Category need to pay an application fee of Rs. 300/-. OBC/ST/SC/Ex-S category aspirants have to pay Rs. 150/- as application fee. Age of contenders must be between 23 to 33 Years As on 15-03-2018. Shortlisted aspirants for Driver will receive pay scale of Rs. 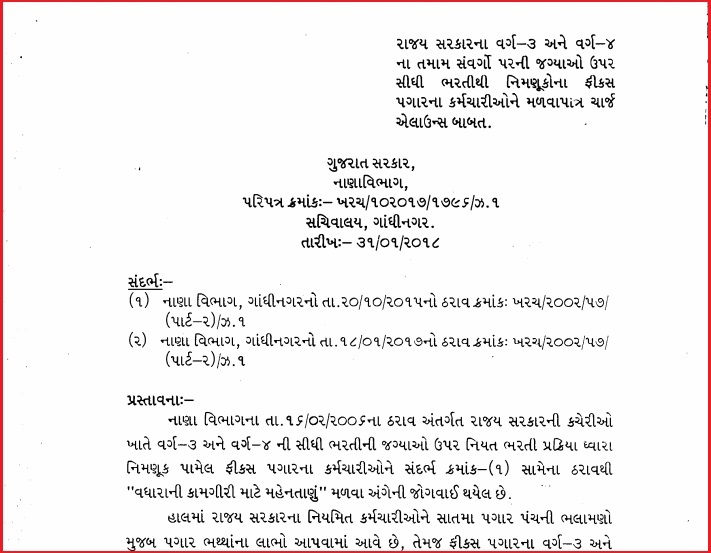 19,900 - 53,200/- which is offered by High Court of Gujarat. Selection of applying aspirants will be based on their performance in Written Exam and Driving Test which will be conducted by the recruitment panel. 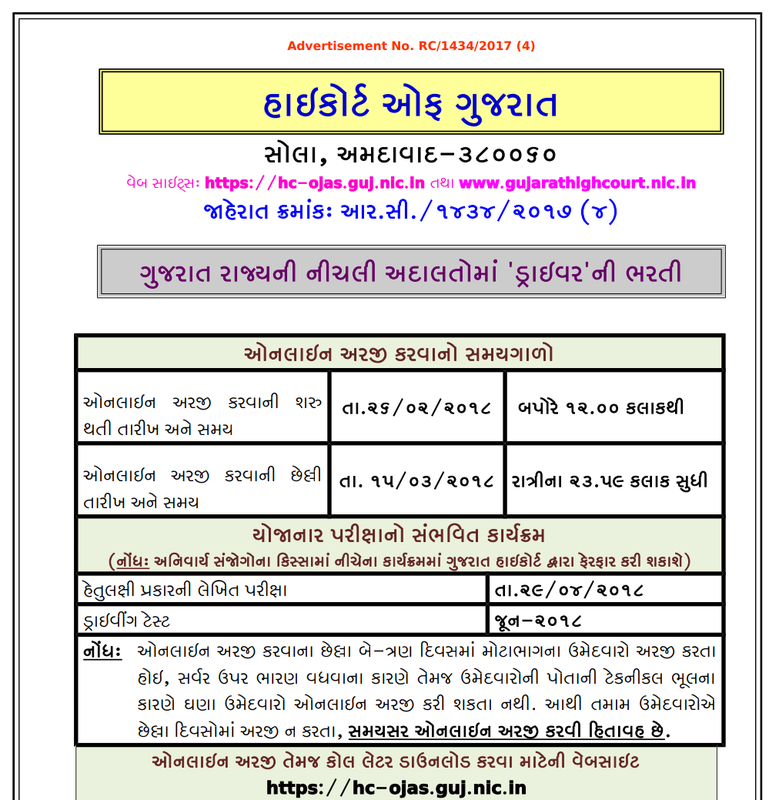 Visitors have to visit the Official Website to apply for High Court of Gujarat and that is www.gujarathighcourt.nic.in. Closing Date of Online Submission of Applications Form Is : 15-03-2018. Indian Army has dispersed A job notification as Indian Army Recruitment. Organization invites online Applications from Result oriented and skillful Contestants for the Various posts of Soldiers in various trades. Job seekers should have completed the education as 10th / 12th / ITI / Diploma with good academic records from well recognized Board/ University/ Institute as per the applied posts. 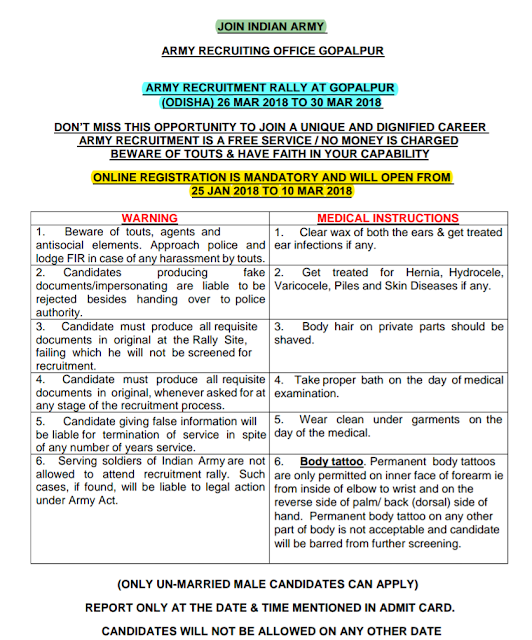 Age of applying candidates must be born in between 01-10-1997 to 01-04-2001 (for Soldier GD), 01-10-1995 to 01-04-2001 (Soldier for Other Trade). Selection of applicants for Soldiers Will be based on Written Exam and Physical Test, Medical Exam. Contenders the first and necessary step is to visit the official site of the organization that is www.joinindianarmy.nic.in. Starting Date of Online Application Form Filling Is : 25-01-2018. Dead Line For Apply Online : 10-03-2018. Written Exam Date : 26-03-2018 to 30-03-2018. 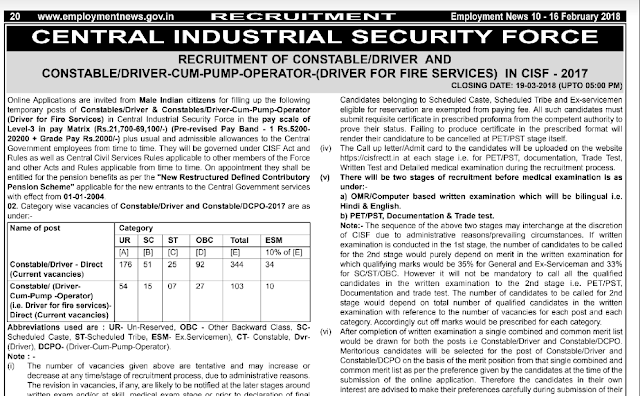 Central Industrial Security Force has dispersed A newest career advertisement titled as CISF Recruitment. The organization invites online applications from Result oriented and skillful Individuals for filling up 447 Vacancies of Constable in various departments. Job searchers should have 10th or equivalent examinations from any recognised board. Candidates who are belonging to the SC/ST/Ex-servicemen categories they are exempt from application processing fee. Contenders who want to join this organization they should be in between 21 to 27 Years. Pay Band for Central Industrial Security Force jobs: Contenders that get shortlisted after qualifying the selection process will get Rs. 5200 - 20200/- With 2000/- Grade Pay Per as per organization norms. Selection of candidates will be done on the basis of their performance in Written Exam, PET / PST, Documentation & Trade test that will be taken by the recruitment panel of organization. 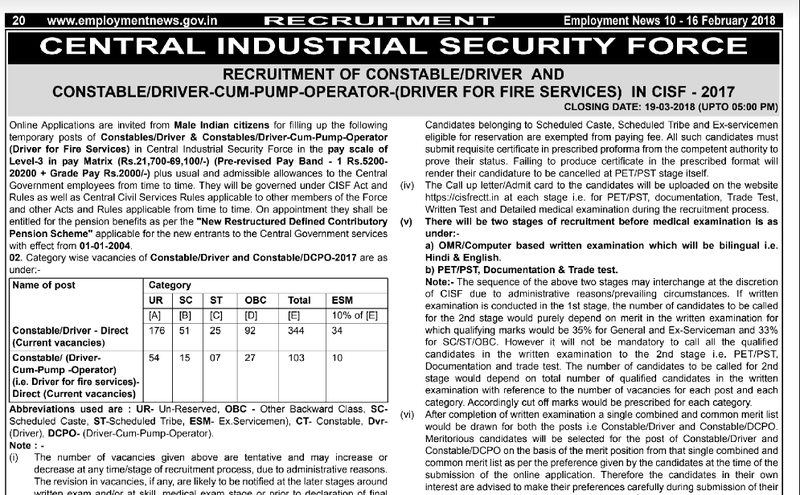 Job seekers are interested to apply for above mentioned positions firstly they need to go through the official website that is www.cisf.gov.in. Closing Date of Online Submission of Applications Form Is : 19-03-2018. Industrial Development Bank of India has broadcasted A latest job notification titled as IDBI Bank Recruitment. Online applications are invited from Motivated & dynamic Applicants to fill 760 vacant posts of Executive in different trades. Aspirants must have Graduation Degree from well recognized Board/ University/ Institute according to post. Candidates belonging General / OBC Category need to pay an application fee of Rs. 700/-. SC/ST/PWD category aspirants have to pay Rs. 150/- as application fee. Age of contenders must be between 20 to 25 years as on 01-01-2018. Shortlisted aspirants for Executive will receive pay scale of Rs. 17000/- (1st Year), Rs. 18500/- (2nd Year), Rs. 20,000/- (3rd Year) which is offered by Industrial Development Bank of India. Selection of candidates that will well fitted in the working & responsibilities of the above said post will be depend on their performance at the time of Online Test. First of all contenders visit the official website which is www.idbi.com. Starting Date of Online Registration of Application Form Is : 06-02-2018. Dead Line To Submit Online Application Is : 28-02-2018. 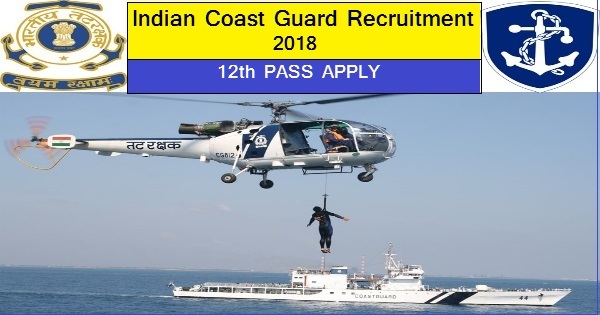 Indian Coast Guard has broadcasted A job notification as ICG Recruitment to inform the Diligent and dynamic Individuals for the 03 posts of Store Keeper (Grade-I). Eligible Applicants can apply for ICG vacancy by submitting their prescribed application form before the last date that is Within 30 Days. Job seekers should have completed the education as 12th with good academic records from well recognized Board/ University/ Institute as per the applied posts. Successfully appointed contenders against this recruitment will attain salary of Rs. 25500/- from recruiting organization. Visit the web portal of organization which is www.indiancoastguard.gov.in. Closing Date for Forwarding Filled Application Forms : Within 30 Days. A mutual fund collects money from investors and invests the money on their behalf. It charges a small fee for managing the money. Mutual funds are an ideal investment vehicle for regular investors who do not know much about investing. Investors can choose a mutual fund scheme based on their financial goal and start investing to achieve the goal. You can either invest directly with a mutual fund or hire the services of a mutual fund advisor. If you are investing directly, you will invest in the direct plan of a mutual fund scheme. If you are investing through an advisor or intermediary, you will invest in the regular plan of the scheme. If you want to invest directly, you will have to visit the website of the mutual fund or its authorized branches with relevant documents. The advantage of investing in a direct plan is that you save on the commission and the money invested would add sizeable returns over a long period. The biggest drawback of this method is that you will have to complete the formalities, do the research, monitor your investment... all by yourself. 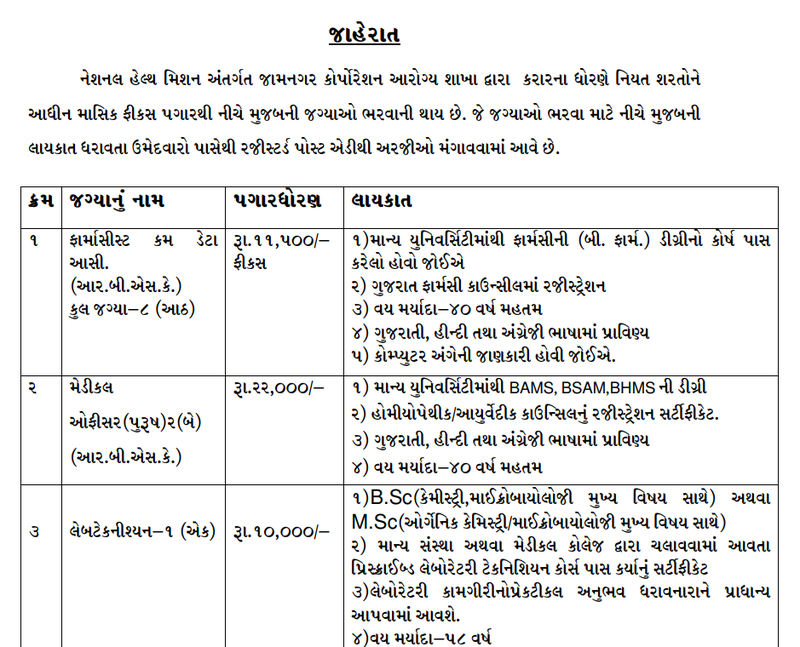 A latest advertisement in regard to Jamnagar Municipal Corporation Recruitment has been transmitted by Jamnagar Municipal Corporation to inform the Desirous and brilliant Job appliers for the 11 posts of Pharmacist, Technician, Medical Officer. Eligible Aspirants can apply for Jamnagar Municipal Corporation vacancy by submitting their prescribed application form before the last date that is 10th February 2018. Job searchers should have B.Pharm,BAMS, BSAM, BHMS, B.Sc, M.Sc or equivalent examinations from any recognized board / institute. Candidates who are willing to apply for Jobs their upper age limit is 40 Years (For Post 1,2), 58 Years (For Post 3). After appointment of the appliers, the organization will pay to them Rs. 11,500/- (For Post 1), Rs. 22,000/- (For Post 2), Rs. 10,000/- (For Post 3). Last Date of Receipt of Applications : 10-02-2018.